Introduction If you are in the position where you don’t want to quit your day job just yet, you can run your party rental business part time. The most likely times you will be working is on the weekends, since that is when parties occur most often.You don’t have to be an expert at starting businesses. It would help to know how to handle customers and do the paperwork, unless you are planning to hire people to do that for you. You do need to have some form of education so you will know what to do and how to do it.Party rental businesses have been started by people from various background and educational levels. Whether you are a stay-at-home parent, looking for a career change, unemployed, a recent graduate, or just anyone who has ever wanted to start their own business, business ownership in the entertainment industry is not only profitable but FUN! Imagine having a job where every day at work is a party. Inflatables are a profitable home-based business with plenty of growth and money-making potential. A business with such a joyful, party atmosphere is easy to get excited about! One of the huge advantages of a business in the entertainment industry is that it doesn’t have to be all or nothing. Many business owners start out their inflatable business on a part-time basis. Because much of your inflatable work may occur on the weekends, you can retain your full-time job, while building sales and customers. This eliminates much of the risk of starting a new business. Whether your long-term plan for business ownership is to earn some extra cash on the side or eventually replace your full-time job, inflatable ownership is the right track.As long as you have the desire to do it, and just like any business, you need to know the ropes. You need to know what is involved in starting a business. It isn’t a matter of just hanging a sign out the window and expecting people to come. It takes a lot more to run a profitable party rental business. There is low start up cash involved in owning an inflatable business. Ownership of many businesses requires small business loans. Ownership of an inflatable business requires minimal capital up front, significantly reducing your financial risk. The demand for inflatables is consistently high with a healthy supply of customers. The party event and rental industry is virtually recession proof. People will always be having parties, and looking for ways to make their events memorable. Inflatables are a great and economical way for your customers to have fun!The market for inflatables goes far beyond the standard child’s birthday party. While birthday parties are a big market, there are plenty of potential customers at your fingertips. From churches and schools to fund raising organizations and family reunions, the potential for your inflatable business is unlimited. 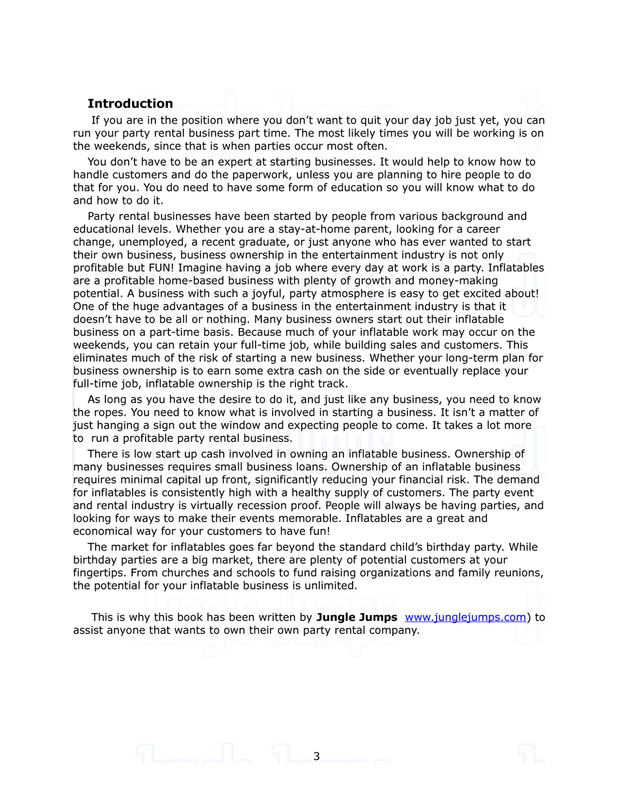 This is why this book has been written by Jungle Jumps www.junglejumps.com) to assist anyone that wants to own their own party rental company.